Welcome To FBM White Label Reward Program Software! Profit Increasing White Label Reward Program Software! Here’s the deal, after watching the video above, we realize the best thing for us to do is make certain we answer the questions you have about Future Business Marketing Automated White Label Reward Program Software (FBM REWARDS), because without luck, you already know FBM REWARDS will help take your business to the next level. No sales hype here – below you’ll find a list for all the FBM REWARDS features found when you get started. 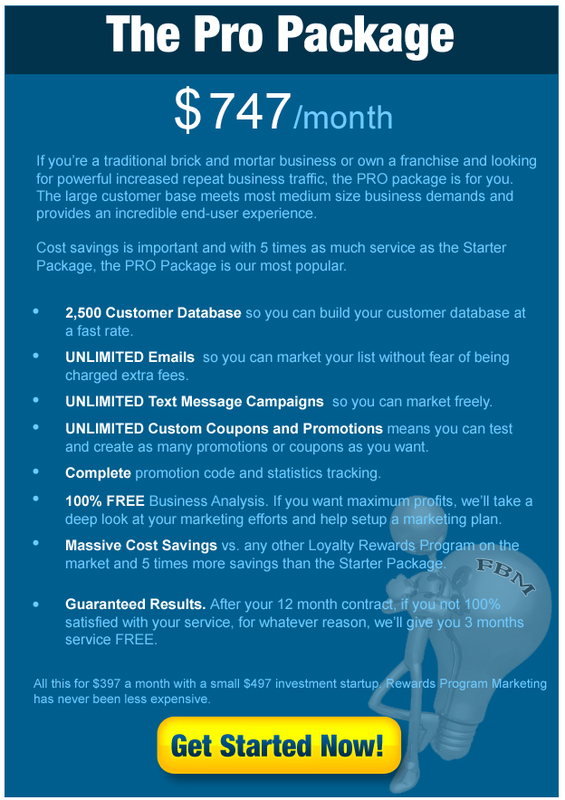 All packages include: unlimited emails, unlimited sms text messaging and 100% automation features. A complete description of each service package found below. Our White Label Reward Program Software is available as a White Label Distributors Software. If you are considering becoming a White Label Reseller please call 800-664-1214. 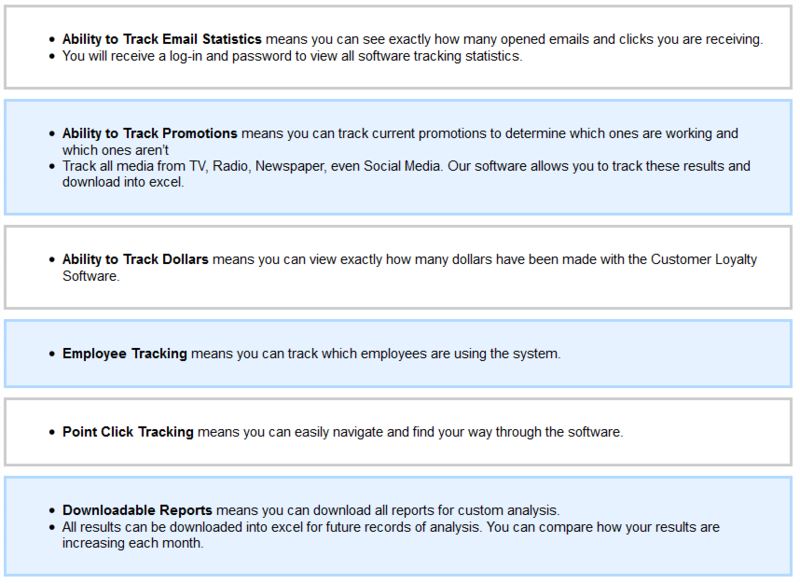 Reward Point Tracking means your customized Automated White Label Reward Program Software has complete tracking ability. Your able to view and interact with Full Tracking statistics capability. 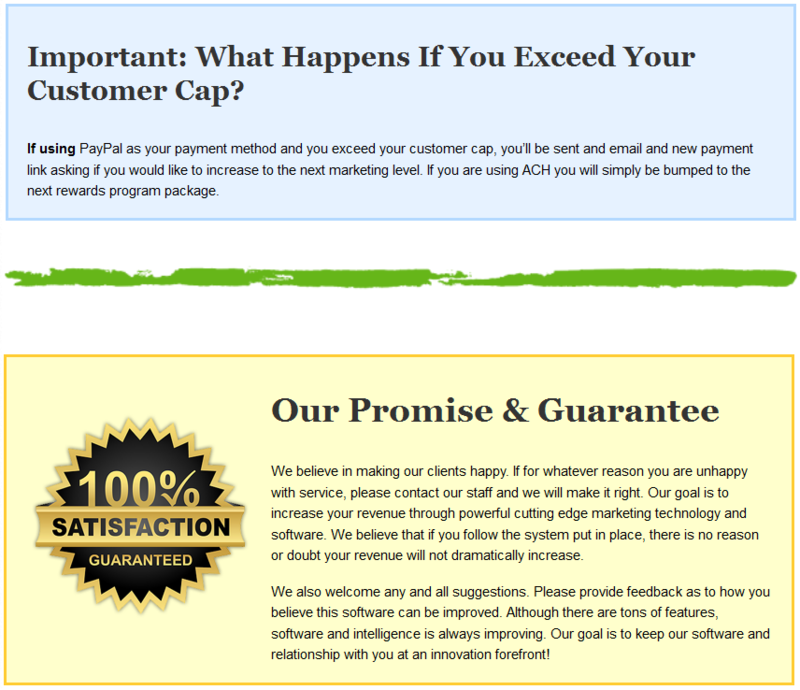 Perfected White Label Reward Program Software! State of the Art Software. The Automated White Label Reward Program Software puts you in the driver’s seat. The paramount features give you full control and customization. Back-office Point Tracking. All point tracking is automated. Simply collect transaction data at the counter, via bar code scanning, POS integration or manually and let leave the rest to us. Custom Trigger Settings. You create the trigger settings inside your White Label Reward Program Software and the rules for each coupon and when points are met, reward coupons are emailed or text messaged to the customer. 100% Back-office Auto-pilot Software. Simply sit back and watch your business reward point coupons roll in. After the initial setup, no work is required from you besides collecting emails and transaction data. Custom Trigger Coupons. Coupon templates are available or upload your own. Choose whether it’s a one-time coupon or monthly repeat. You have complete coupon trigger control. Unlimited Emails & SMS Text. All packages allow unlimited emailing and sms text messaging. Spam users and abusers will be banned immediately. Custom Surveys. Reward customers for filling out surveys and see how they rate your services. Social Media Integration.Post offers to social media platforms automatically. Allow your customers to receive bonus points for referring friends and posting offers on their social media platforms. * This is custom software that is in continual development. Please make product suggestions. Mass Emailing Features lets you send weekly/monthly email to bring repeat business. Custom Email Templates allows you to brand your emails with your logo and company name. Looking professional has never been easier. Coupon Insertion Links let you create coupons and insert the dynamic expiration links inside your email templates. Once clicked, pop-up coupons display. Segmented Emailing allows you to choose specific parameters or customers to email if you do not want to email your entire email list. Email Split Testing allows you to test what headlines and templates work best. Split Testing puts you in control. When sending emails to large contact lists, 2500+, testing what message is most effective dramatically increases sales. Dynamic Content Settings & Custom Fields allows you to personalize each email based on information you’ve received and insert custom fields like signatures. Customizing your email templates and subject headlines can increase open ratios as much as 600%. Working smart allows you the best bang for your dollar. Custom Surveys mean you choose what questions to ask your customers. *Auto-pilot features. A-F Grading means you can quickly view overall performance from each question. Survey Points means you can reward your customers for filling out surveys. Survey Link Integration means surveys can be integrated into any email template. Survey averages are displayed and your given the ability to view, download/export data and respond to customers if needed. Survey Email Resolution means you can email customers directly from the software who have had a bad experience. If you’re inclined, you can attach a special discount coupon to help resolve the issue. Text Messaging Works. Having a 95% open ratio, you’re bound to have customers knocking down your door. 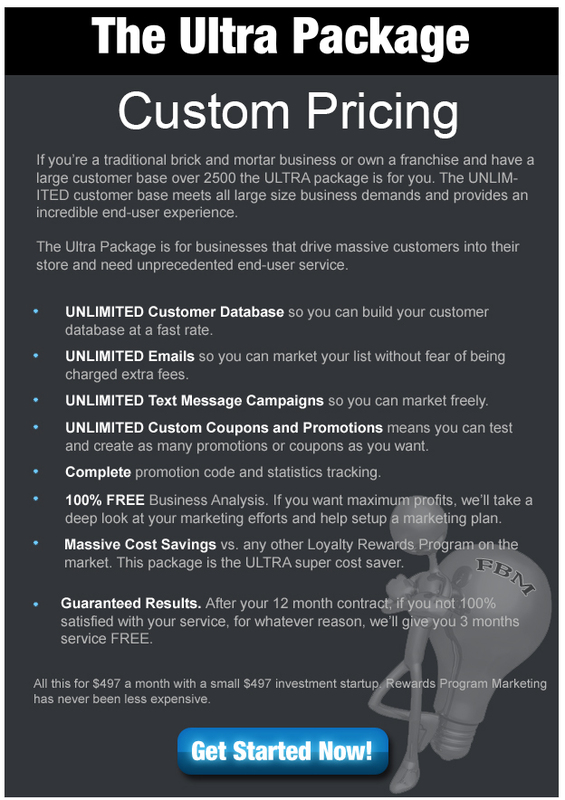 Unlimited Text Campaigns means you can create as many promotions as you would like. Automated Text Messaging means you can program text messages for future delivery. Unlimited Text Message Packages means you can send as many text messages as you would like. The text message software allows users to unsubscribe to text message delivery at any time so you’re not sending text messages customers who decide to stop this feature. Email Coupon Automation means you can create an email campaign and automate deliverance frequency. Text Message Automation means you can create a text campaign and automate deliverance frequency. Complete Back-office Automation means you can create promotions one-time and place the software on auto-pilot. POS Integration means you can bar code scan coupons into the system or data swipe reward cards. Alternatively you can manually input all data. Each POS system is difference and custom work may be needed for import export features to work properly between POS and FBM Rewards Customer Loyalty Software. No matter how Big or Small your business, FBM’s Customer Loyalty Software has a has a reward program package suitable for you. 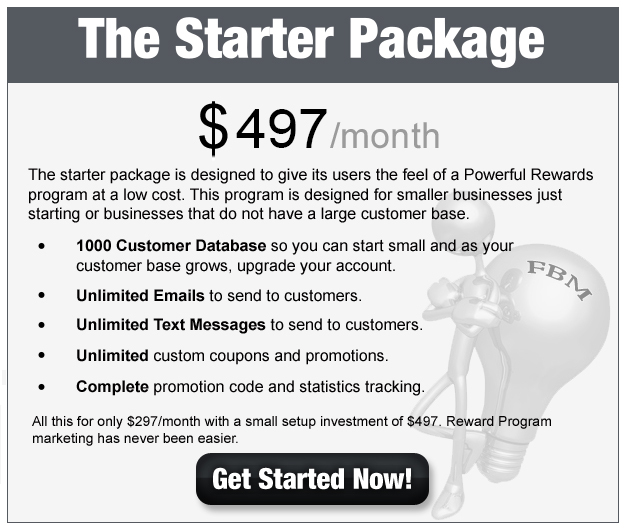 FBM Rewards comes in three levels of service – Starter, Pro, and Ultra – or, Big, Bigger, and ENORMOUS. You don’t have to buy any more Rewards Program Points than you absolutely need. Start small, and upgrade your package at any time! Remember, we’re here to work for you. Get started now or give us a call! 800-664-1214. Start a FBM White Label Reward Program Software PROGRAM Today! Between the video and details provided above, there should be no question at all what FBM Customer Loyalty Software is, what it does, and what it WILL do for your business. Reward Program marketing using White Label Reward Program Software has never been so cost effective for any business! To get started immediately, just click the “Get Started Today” button below. Start Your White Label Reward Program Software Today!